Watching your favourite movie on the big screen is always a great experience. This year, Cineplex’s Flashback Film Fest is returning with beloved titles including Jurassic Park, Pulp Fiction, The Princess Bride, Fight Club, and many more. With the gloomy February weather approaching, the festival offers an opportunity to stay warm and enjoy the nostalgia. Toronto’s longest-running celebration of Black History Month, Kuumba at the Harbourfront Centre, will be taking place over two weekends this year with an impressive lineup of musicians, comedians, workshops, are more. Themes being explored this year include Black Lives Matter, The Invisible Majority, and female empowerment. With a rich history of sparking discussion and awareness of race-related issues, Kuumba 2017 promises to be especially educational and thought provoking. Ontario is known for its many breweries and vineyards that produce authentic Canadian craft beverages, often with a nod to the region’s history. Side Launch Brewing in Collingwood pays homage to the shipbuilding industry that the town was built around, while Junction Craft Brewing was inspired by the historic West Toronto neighbourhood that it’s named for. This February, craft beer labels from across the province will be coming together to share their passion and expertise at the Roundhouse Winter Craft Beer Fest at Roundhouse Park. The first 50 attendees will receive a free toque! The Winter Folk Blues & Roots Festival is an all-ages event that aims to recreate the casual atmosphere of a summer music festival in the wintertime. Over 150 artists will perform at 5 venues, specializing in styles including urban, blues, rock, jazz, country, folk, and root music. The $15 wristbands allow wearers access to all of the concerts and presentations. Author Haruki Murakami wrote that “Music brings a warm glow to my vision, thawing mind and muscle from their endless wintering.” By mid-February, a break from the endless wintering is likely to be just what most Torontonians need! The 17th annual Wavelength Music Festival is back this Family Day Weekend with three nights of performances and celebration. Designed as a platform for independent musicians from Toronto, many individuals and groups experienced breakout, career-making shows at Wavelength – including Toronto favourites like Broken Social Scene and Feist. This year’s festival, held at The Garrison on Dundas, promises to be equally diverse and innovative, featuring “icons and upstarts” alike. Dubbed “The wildest theatre fest in town” by Toronto Life, the Rhubarb Fest Theatre Festival at the Buddies in Bad Times Theatre is all about pushing boundaries and experimenting with new ideas. Audiences and actors are encouraged to interact with each other and try out new things, making each performance a unique experience and bolstering creativity and expression among all. The Canadian International Auto Show claims to hold the greatest commitment to the exotic car market of any show in North America. It’s not hard to see why – the show is often the first to unveil a new car model or to offer test drives for upcoming makes. This year, the Aston Martin concept hypercar will make its first appearance in North America before production begins in 2018, and Audi will be offering test drives of its latest 2018 Q5 model. Always a popular event, this year’s Auto Show promises to be as innovative and unique as ever. Meticulous, efficient, intelligent, and conscientious: these are thought to be the strongest characteristics of those born in the Year of the Rooster, which officially begins on January 28th. The Lunar New Year is arguably one of the most celebrated events in the world, with thousands of celebrations and festivities -particularly in China, Taiwan, and Korea. Lunarfest will be hosted at Metro Hall and features the Rooster Winter Games as well as a variety of workshops and family-oriented activities. 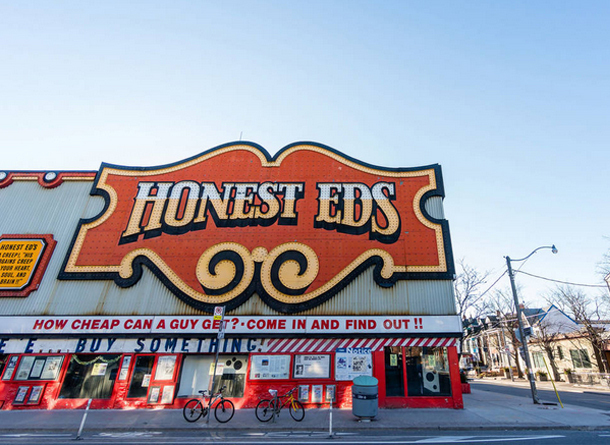 A once-in-a-lifetime event, the going away party for Toronto’s most iconic department store will be a tribute to Honest Ed’s legacy as well as a celebration of the space moving forwards. Adil Dhalla, executive director of the Centre for Social Innovation (which is hosting the event) says that the festival is important in wake of the situation in the US, to reaffirm Canadian values of inclusivity that were highly valued by the Mirvish Family. The event, called Toronto For Everyone, will feature a market, dance party and a variety of multi-disciplinary programs. The Distillery District is one of the city’s most iconic historical areas, with a rich history spanning its time as the largest distillery in the world, through it’s struggles during prohibition and the area’s eventual development as an entertainment district. Today, the Distillery is a cultural hub of cafes, galleries, studios, and seasonal markets. On February 7th, Dessert Pervert Food Tours is offering a tour of the Distillery that stops by two local bakeries, a chocolatier, and concludes with a 4-part tasting at Toronto’s only Sake brewery. Attend a symphony by one of Asia’s most famous orchestras just in time for the Chinese New Year! The Beijing Symphony Orchestra’s latest performance is designed to be a combination of classic Chinese orchestral works and Brahms’ Violin Concerto as well as Mussorgsky’s Pictures at an Exhibition. The orchestra is well known for it’s famous performances at the Great Wall of China, and on the 7th will be recreating the rich cultural atmosphere at the Sony Centre for the Performing Arts. The Four Seasons Centre for the Performing Arts at Queen and University is one of the city’s most beautiful spaces, with iconic urban architecture and floor-to-ceiling windows that flood the building with natural light. Step out of the cold and into this stunning contemporary haven to enjoy the Canadian Opera Company’s Free Concert Series. Artists from around the world will create performances for six different categories: vocal, piano, jazz, dance, chamber, and world music. Live concerts, dance performances, and presentations are given by up-and-coming artists as well as established stars. Nordic Pole Walking is becoming more popular in Canada as a method of exercise and entertainment. Light, flexible poles provide a low-impact method to exercise 90% of the body’s muscles and overall promote one’s health, physical activity, and rehabilitation without excessive strain. Nordic Pole Walking also offers an opportunity to explore beautiful natural scenery or socialize with friends. Evergreen Brickworks is a perfect location to learn a new skill and admire the wintry Don Valley as well as the seasonal Ontario foliage and wildlife. Ice Breakers is returning to the Toronto Waterfront after the interactive public art displays were met with overwhelming popularity last year. This year, a new app and art guide will enhance the experience and provide more opportunities to learn about the artist and their style. Toronto’s waterfront tends to be busiest in the summertime, but Ice Breakers provides an opportunity to enjoy it in the cold weather as well. Tibet, Mexico, Taiwan, Vietnam, Thailand, Switzerland, Sri Lanka, and the United Kingdom are just some of the countries represented at Toronto’s Street Food Market at Evergreen Brickworks this winter. A variety of snacks such as arepas, momos (Tibetan Dumplings), authentic Belgian waffles, and even Vietnamese-Mexican fusion dishes will be available in classic street-food style. The event is also hosting a weekly contest, where people can post their favourite dish from the event for a chance to win a $50 food voucher.